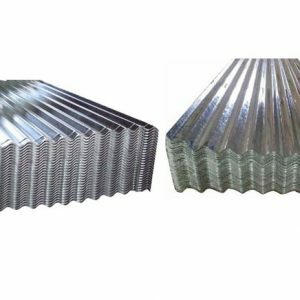 Galvanized iron profile sheets have been successfully used for decades in various industries, the primary one among them being in construction industries in applications which include roofing, support beams, braces for walls, and piping construction projects. It is also highly popular in marine applications as unlike other materials these do not corrode or deteriorate. The GI profile sheet is covered with a uniform zinc-plated layer to prevent corrosive substances from reaching the underlying steel or iron thus providing protection against corrosion. Even if the base layer is exposed due to surface damage, the zinc coating surrounding the damaged area continues to protect the layer from corrosion. The galvanized surface is smooth and uniform and provides an aesthetically pleasing appearance. The quality of the base iron, the amount and composition of the zinc coating are all specifically designed to provide optimum performance for each application. Depending on its intended use, chemical conversion coatings are applied on GI sheets after galvanizing to provide added protection to corrosion and also to ensure proper paint adhesion. Galvanized iron profile sheets come in varying thickness and specifications to meet the different application requirements. They are available with reputed local dealers and suppliers of roofing materials. It also offers great resistance to mechanical damage in transport, during erection and when in use. weldablity, high resistance to corrosion, etc? If you are looking to purchase quality galvanized iron profile sheets for your requirements, visit Burhani Oasis, located in Dubai, UAE. Our GI profile sheets offer customized characteristics for an impressive range of applications to meet the increasingly advanced and diverse needs of changing markets. Developed with high grade material using the latest technology and under strict quality control, all our GI sheets conform to the established quality parameters of the industry to ensure high performance in all the applications it’s used for. Burhani Oasis is the best dealer of Galvanized Iron Profile Sheet in UAE. Contact us today to know more about how we can help you meet your galvanized iron profile sheets requirements. Galvanized Iron Profile Sheets are available in Dubai, Sharjah, Abu Dhabi, Ajman, Fujairah, Ras Al Khaimah, Umm Al Quwain, across UAE.